Thanks honestly I am nervous we have until april so I am going to refine it some more. Don't be nervous, you're stories are really good. If anyone beats you then they're probably Josh in disguise. Best of luck to you shinros, and anybody else from here giving it ago, wish I had the writing skills to do it myself! All the best to everyone entering this, great opportunity for budding authors that you wouldn’t get elsewhere! I envy your writing abilities and dedication to the craft! I'm going to try my luck with two stories: one a procedural story where a freeguild captain must enlist the help of a Nagashite Necromancer in uncovering a series of murders and another about a knight of the order of the fly defending a settlement in the blighted duchies from an attack of forces of the Living City. Maybe think of doing that story of a heist set in Hammerhal. Oh wow, please feel free to post those on the fiction sub-forum if you feel like it. Lord Kragan wrote: I'm going to try my luck with two stories: one a procedural story where a freeguild captain must enlist the help of a Nagashite Necromancer in uncovering a series of murders and another about a knight of the order of the fly defending a settlement in the blighted duchies from an attack of forces of the Living City. Maybe think of doing that story of a heist set in Hammerhal. Baron Klatz wrote: Oh wow, please feel free to post those on the fiction sub-forum if you feel like it. Been a bit sparse new release wise, but the year is yet young. I read Mr Reynold's Fulgrim book which was most enjoyable. Probably the best in the Primarch series thus far IMO -- edging out the Lorgar one. Almost all the stuff I want for this year is dropping in one week after another right now, I just need to wait until next weekend for Kingsblade to go up for preorder so I can complete the order. Amidst the ruins of the Lantic Empire, a few brave survivors fight to the last. With Chaos everywhere and the empress lost to a burst of lightning from the Heavens, it falls to a captain, a sorcerer and the new emperor to try and save their people. It's a sweeping epic, longer than your usual short story and packed full of action, drama and intrigue – and it's the Black Library debut for Evan Dicken. The Age of Myth is over. After centuries of peace, the forces of Chaos have returned to the Mortal Realms, and Order is being overrun. Sigmar has retreated to Azyr, and those left behind make their stand in the face of the numberless hordes of the Dark Gods. In the ruins of the Lantic Empire, a few brave heroes lead their shattered armies in the defence of their once-mighty realm. With their empress dead, a captain, a sorcerer and the new emperor must make a stand and try to save their people. It's a pity it's just a short story. Wow, this one was definitely not expected ! Maybe it hints at a mortal death faction, considering the POV character is VERY bitter about sigmar's retreat. I believe it'll get posted in time for the release date of the 27th January. And you're right, IIRC the Flesh-eater Courts Battletome mentions that many Lantic survivors became ghouls roaming the ruins of the empire. And apparently, in the end the Lantic Empire is just a more steampunk and golden version of the Empire / Freeguild (which is what I understood from the snippets we had in the fluff and totally fine by me). It's also nice to have the Fyreslayers battletome reference about the Gilded Steamgird and the Lofnir Lodge. 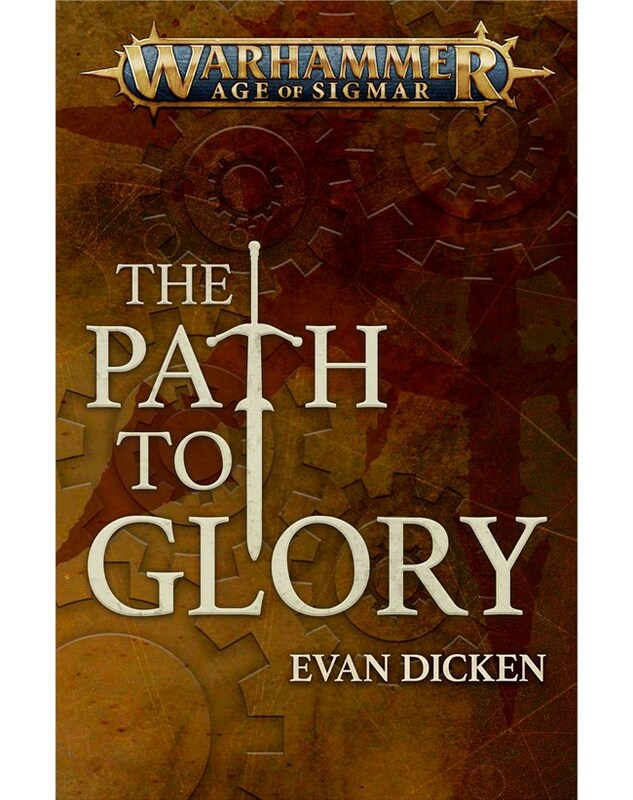 So I have read path to glory and I have to say I enjoyed it what it shows is how people felt when sigmar shut the gates and trust me you feel for these people. If you read up on the setting such a decision is being felt even in the present with the reclaimed and not even once does sigmar explain himself. I honestly get Grungi's words in spear of shadows I can easily see why people turned to chaos or especially nagash in this case. Also stormcast have no right to have beef with people that went over to chaos because of sigmar closing the gates to ayzr. Plus sigmar is also enabling the situation with reclaimed. I really understood why the characters were upset in this short story. do they become ghouls in the end or just join chaos? It's chaos because it takes place in Chamon, around this time Nagash is actually busy defending what's his according to the lore. Unlike sigmar. It's just more of the fact Sigmar's decision is still being felt in the present and not even once does sigmar try to fix it. I still think this story helps shows that the setting is more grey than anything when it comes to the gods. Also, a post from the author of The Path to Glory. I'm wondering how does BL "reach out" to ask you submissions like this. How does it learn about you, and decide to contact you ? Finished this over the weekend, by far my favorite Primarch book, my only complaint is that it is a little short. I would be interested in the opinions of any Iron Hands aficionados on this book on how they feel it portrays their Primarch as he comes across as Angron should have been if he'd never had the Butchers Nails implanted. It was also great to see the Imperium being one upped in the genetic engineering, massive overkill, pure evil stakes by the Gardinaal all for Ferrus to claw back that in the book's final act with utter destruction of the entire planet. The relationship between Fulgrim and Ferrus needs its own buddy buddy book as well. The Empress was pulled away at her death by Sigmar so now a Stormcast? The now followers of the Chaos Champion should be interesting in sequels and if they later encounter their former Empress. Interesting that it appears that the Fyreslayers betrayed them..
Well, not as much as betray them, but archaon hired the Lofnir lodge with an obscene amount of Ur-Gold to have them send a masssive phalanx of Magmadroths to break that fortification line. I would be interested in the opinions of any Iron Hands aficionados on this book on how they feel it portrays their Primarch as he comes across as Angron should have been if he'd never had the Butchers Nails implanted. My guess is, the usual piss and vinegar as always. On Saturday 24th February, Games Workshop and Warhammer stores around the world will be holding a celebration of all things Black Library – and we have the low-down. The event will be in part a celebration of 20 years of fantastic adrenaline-fuelled fiction from the worlds of Warhammer, and in part because the brand new Inquisitor Eisenhorn novel, The Magos is released on that day. And stores will have a host of special merchandise to commemorate both of these things. First, very excitingly, will be an exclusive resin Citadel miniature of Inquisitor Gregor Eisenhorn himself. This model is based on the classic Clint Langley artwork depicting the Inquisitor in his younger days, and is a perfect collector’s piece… and also a great addition to any army of the Imperium, as he will include rules in the box! Yes, you’ll be able to use Inquisitor Eisenhorn to bring ruin to your foes on the tabletop. Pick him up from the 24th in-store or online. But what about goods celebrating Black Library’s anniversary? There will be plenty, and we don’t want to give everything away just now, but remember a while back when you guys voted on which out of print books you’d like us to bring back? Keep an eye out for all the Black Library Celebration news, right here, very soon. Well, that might get me out to the Battle Bureau. Eisenhorn model, a box of book covers released on postcards in a fancy box and a blank journal released this month to celebrate 20 years of BL. I’m hoping and kind of expecting a suprise book release too. Maybe Ravenor box set? Eisenhorn model looks cool, I will get it if I have a chance but will pass swiftly on the notebook and postcards. Who exactly has been acclaiming Inquisitor: Martyr, Bob from Accounting?